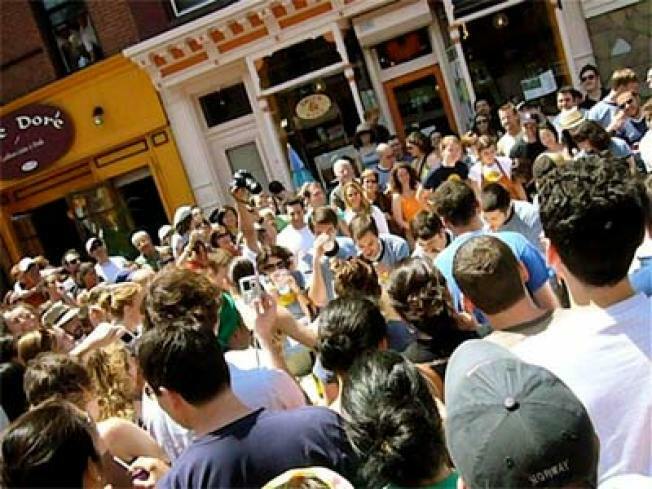 Stinkfest's Cheese-Eating Contest takes over Smith Street. HOT WHEELS: The heart of the annual Smith Street Fun Day—an alfresco event with live music and much more spilling out onto the Boerum/Cobble Hill thoroughfare--is fromager Stinky Bklyn’s’ Stinkfest 2010, an all-curd-all-the-time tasting extravaganza. And the heart of that is a cheese-eating contest, wherein hopefuls will compete to see who can bouffe the most Cantelet in two minutes flat. Sunday, 11AM-6PM. WILDKINGDOM: It’s the last Sunday in June, and you know what that means: time for NYC to take to the streets to celebrate gay pride. But wait! This year marks the First Annual Pet Pride Contest (sponsored by PETCO) which you just know is going to be the highlight of the whole thing. Twenty finalists have been selected to strut their pridealicious stuff in front of celeb judges like Michael Musto and you, the fur-adoring public. Hudson Street between Abingdon Square and West 14th Street, Sunday, 12:30PM. MUSIC MAKERS: Fort Greene’s Commodore Barry Park plays host to the 6th Annual Afro-Punk Festival, and there’s excitement in the air: Afro-punk godfathers Bad Brains are finally headlining the affair, which also lists bands like Mos Def, the Cool Kids, P.O.S., Ninjasonik, plus goodies like graffiti art and skate/BMX competitions. It’s a whole lot of summer packed into one weekend. Saturday and Sunday, see the schedule here. SEE IT JIGGLE: The Jell-O Mold Competition returns for 2010, as competitors explore “the resilient properties of Jell-O as a design medium, cultural phenomenon, and food that just won't quit.” Yup. Gowanus Studio Space, Saturday, 6PM.